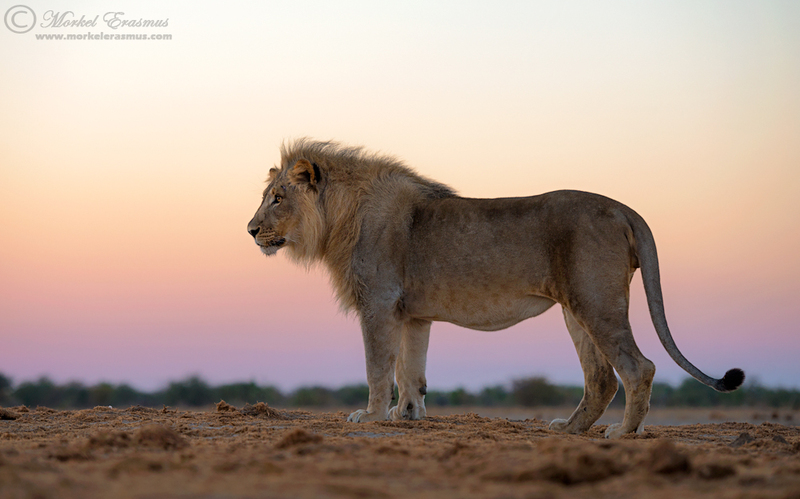 This young male lion was photographed from an underground bunker hide in the Etosha National Park, Namibia. I got up at the crack of dawn to see two young males approaching the waterhole. I grabbed my cameras and ran to the bunker. What followed was a beautiful sighting in beautiful light! At this point, a few minutes later, one of the young males walked right up to the opening where I was shooting from. I was able to capture this frame using a 140mm focal length, and it's pretty much uncropped. In order to get those lovely colours in the sky on the horizon, I needed to blend back a darker exposure of the same RAW file using luminosity masks. I hope you like it! Do click on the photo to view it properly.